When I was a younger man, I landed a plum job at a university helping to stand up a new computer application which was going to help the university in their new fund raising campaign. The job I had was to figure out how all of their old information would fit into the new system, and then to write all of the programs to move the data. This was a “plum” assignment because I was midway through my Masters degree at this same university, and the tuition benefit helped me finish. For my Masters, I was concentrating on the about-to-crash, hot-topic of artificial intelligence, and so as a reward for my good work, the Institutional Advancement office agreed to let me play around with some ideas for an expert system that would be integrated into the new application and that would encapsulate the best practices performed by the development staff in the “major gifts” operation. In performing my knowledge engineering, I interviewed about a half dozen or more “development” experts, many of whom were currently working the major gifts space. From these folks, I learned that there was a core, commonly-held metaphor that was then regarded as underlying the entire development process. The concept was documented in a paper I found as part of my research, written by David Dunlop, who creditted the idea to G. “Buck” Smith. Dunlop, David R. “Major Gift Fund Raising and Tracking System: Concepts for Educational Fund Raising.” Seminar II Financial Development in Theological Education, April 1984. The idea, basically, was that in any effort to cultivate a potential major gifts donor, a natural process or cycle occurs consisting of gradually growing a relationship with the donor over time. For major gifts, this process may take quite a long time to develop to its fullest potential, and there are several definite steps that must be taken, and the relationship must grow very rich before the donor will be ready to make the gift. The process is envisioned as a cycle, as for the most committed donors, the university may be able to go back more than once over the course of the relationship to solicit additional gifts. The following description and diagram is from my own paper which I and my Masters sponsor published describing the integration project. Goldbogen, Geof, and Geoffrey A. Howe. “Integrating Artificial Intelligence into Existing Software Applications.” Advances in Expert Systems for Management. Vol 1, 1993. Grabowski and Wallace, ed. The cycle begins with the identification of a potential donor. Then there are several cultivation points that must be reached, variously named by different officers. These points make up the body of the “cultivation” of the prospect. 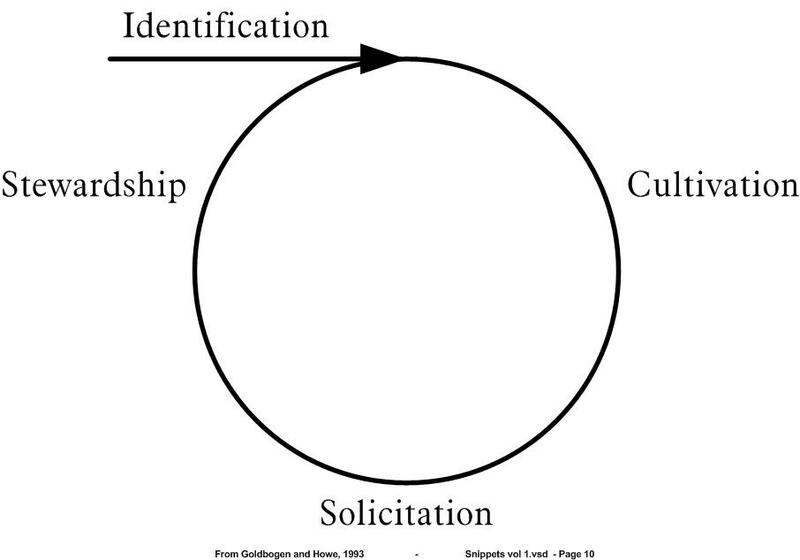 Once all points have been reached, the “solicitation” phase begins, which is characterized by more intense activity, and which culminates in the “ask”, when the prospect is asked to make a commitment. Following the commitment, the “stewardship” phase begins in which the prospect-turned-donor is thanked for the donation, and more importantly, is shown the results made possible by the gift. The development cycle defines the approach taken by the development officers, and also provides a map of the development terrain. By positioning a prospect on the cycle, the staff person knows what the prospect is deficient in, as well as what has been accomplished with the prospect. Position in the cycle can also provide an indication of the timing of the solicitation – when the ask will be made. The interesting thing about this description is that it sounds so clear cut and regular. But impressions are deceiving. 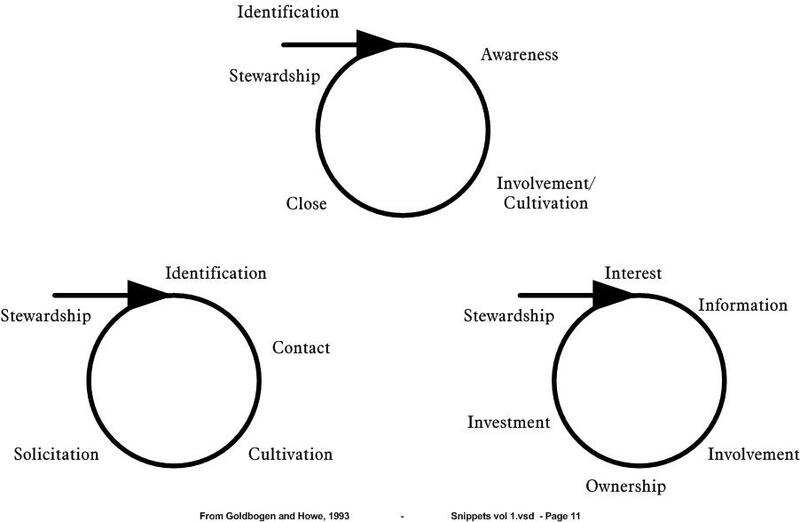 As I was interviewing I found that every single development officer, while they had all agreed on the basic cycle, all had defined their own personal versions of the cycle, including the specific moves and sequences necessary to move a prospective donor toward a major donation, and even their own vocabulary of the various phases of development. Three examples representing three of the most divergent versions of the cycle metaphor appear in the second diagram (also from the same source). Most software is written to a least common denominator domain model. Some software permits the business to customize it to their own context. Software which permits individual users to customize it to their personal symbology while allowing the business to track progress against a common standard is a true rarity. While it was just an exercise in prototyping, this domain problem always seemed to me to have great potential to be one of those situations.